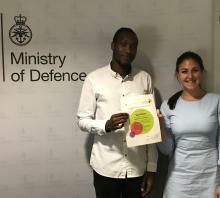 The Directorate of Defence Communications (DDC) recognised that the aspirational rhetoric of diversity and inclusion strategies means little unless backed up by prompt action, so they resolved to deliver a meaningful initiative. The catalyst was the realisation that DDC’s workforce in London comprises 5% BAME, whereas the overall economically active London population is 37% BAME. This contrast is stark, and while redressing the imbalance will obviously be a long term challenge, the team were determined to act immediately. Using contacts from within MOD and DWP, the team identified the Movement to Work scheme operated by Jobcentre Plus as a key opportunity. They worked with Jobcentre Plus to identify young BAME jobseekers in the NEET (not in employment, education or training) category, and set up a two week work experience opportunity within DDC which gives the disadvantaged young person a fantastic opportunity to experience the fast moving, dynamic, challenging and fun working environment within DDC. It also enables the young jobseeker to provide real, actionable insight for DDC by personally working on content design and assessing suitable channels through which DDC can tell the story of Defence and the UK Armed Forces to young audiences, with an eye towards towards future recruitment, (military and civilian). Realise that work can be fun!